5 Reasons to be 100%Open. At our last Monday Morning Meeting, as I was enjoying a slice of cake and listening to my colleagues’ lists of achievements over the last week, I realised that I feel that I am now a part of the team, 6 months after I came across the 100%Open website for the first time. So I decided to write down some of the things that got me here. In 2016, after a few years of both exciting and challenging work at the United Nations Development Programme’s (UNDP) Moldova Social Innovation Hub, I decided to move countries to gain international work experience in the innovation sector. Why move to the UK? When an innovation professional thinks of a country that is well known for its performance on social innovation, she inevitably thinks of the UK. For instance, in 2016 it was ranked second out of 45 nations in the Economist’s Social Innovation Index. Moreover, having graduated with a Masters Degree in Public Policy from Sheffield University , I decided to set my eyes on the UK. Even an impending Brexit, with the uncertainty it is creating for EU citizens, hasn’t dissuaded me from looking for opportunities in London, one of the most international and diverse cities in the world. With more than a third of the city’s population being born outside UK, I was confident that I could find an exciting job here and a team that will accept and enjoy diversity. In Moldova the media would reflect that the UK is unprepared to handle all implications of leaving the EU, but would nonetheless strongly suggest that EU leaders will insist on safeguarding the rights of European migrants already living in the UK. I decided that while things will take a couple of years to straighten out, I shouldn’t be postponing my career plans and so I started looking for interesting UK companies working in the innovation sector. Working at UNDP, I used to do co-creation and public service innovation by involving citizens and service providers. Although I had never heard of ‘open innovation’, the 100%Open definition of the term allowed me to see that it is very much about collaboration and co-creation. So I was excited about the opportunity to continue to work in a similar field, with different clients and in different sectors. 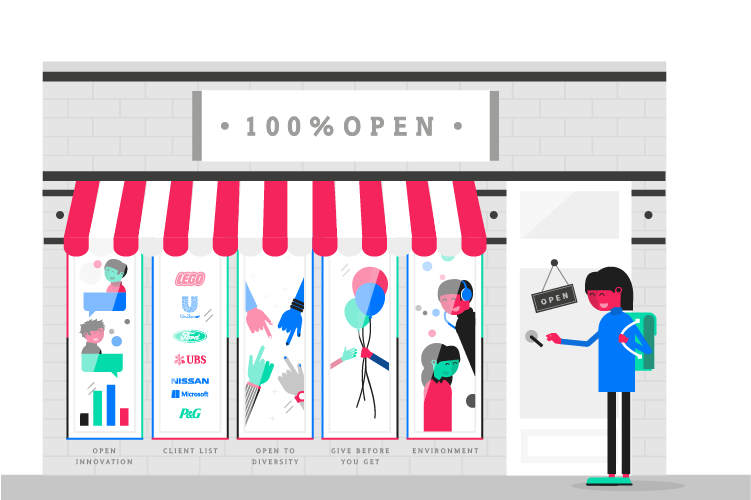 The breadth and variety of clients that 100%Open works with impressed me, including as it does well-known brands such as LEGO, Unilever, FORD, P&G, UBS and Nissan. As impressive as this list is, 100%Open also has a track record of working with charities and the public sector. This was important for me as I was looking for a job with social impact, given my previous experience in social innovation, and after all, I am a millennial! According to various studies millennials are arguably, the most purpose-driven generation looking at making impact in their workspace or outside it. With all the Brexit anxiety and often negative rhetoric surrounding eastern European migrants in British media, I thought the best way to see if a company embraces diversity is to look at their deeds not their words. So I browsed through the profiles of 100%Open employees and found people of Bulgarian, American, Australian, German and Indian descent. Thus, I realised it’s a place that understands what it means to work in a diverse and cross-cultural environment. One of the first things I did on the website was to take a couple of open innovation readiness tests – the Co-Lab test and the Open Organisation Test, both part of the 100%Open Innovation Toolkit. I also shared them with my colleagues at the UNDP. All the tools, tests and guidelines are available to use and download for free, to encourage the use of open innovation. I later learned that is one of the company’s principles of collaboration, to Give and Get in return, by always Giving first. The final reason that persuaded me to apply is the overall sense of fun and passion that showed throughout the 100%Open website. If nothing else, I knew we had a similar taste in music with my future colleagues! Luckily, my observations from this quick research on the company’s website turned out to be true, and now I can proudly call myself a 100%Opener. But I guess, the bigger conclusion is that a website is indeed your main shop window and it goes a long way in showing the company’s culture and approach. And if that quality and attitude that shows on the website is consistent throughout the company’s work, then you’ve earned yourself some dedicated new staff and happy clients. Lovely. Great to have you as part of the team Cristina!